Even in 2016's summer schedule, jam-packed with computer-generated anticlimaxes, there were few takers in the US for Free State of Jones, writer-director Gary Ross's attempt at an adult blockbuster. Matthew McConaughey plays Newt Knight, a Mississippi farmer and Confederate soldier who rebelled against corrupt authorities to form his own progressive free state, but the history lesson feels considerably more interesting than the worthy drama presented here. Free State of Jones begins arrestingly, as Knight is introduced working as a nurse on the battlefields of the US Civil War, quickly becoming disaffected by the death of his conscripted son. Seeking medical help for a sick child, Knight discovers a group of escaped slaves living on swampland and decides to organise them into a militia to oppose their overlords. Coming off the back of global hit The Hunger Games, Ross manages the similarly rustic set-pieces with considerable visceral style, helped by McConaughey's haunted, intense presence. But, as with Steven Spielberg's recent biopic of Abraham Lincoln, this version of history feels far too heavily filtered through 21st century sensibilities; Knight is presented as such a fiercely enlightened white saviour that it's hard to believe he could ever have been such a saint, his relationship with Rachel (Gugu Mbatha-Raw) is somewhat coyly developed, and a series of flash-forwards to a courtroom case involving one of his grandchildren unnecessarily interrupts the action. 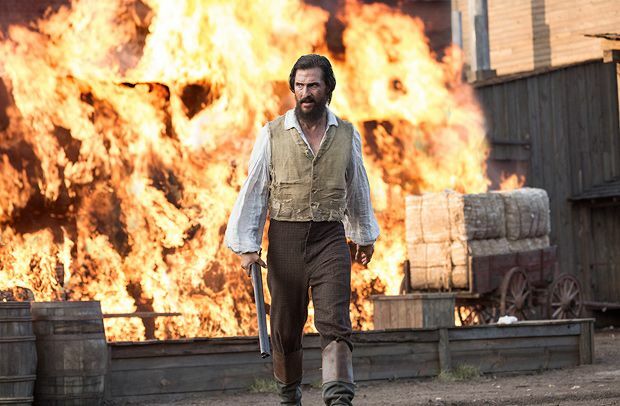 Free State of Jones deserves credit for bringing a still-controversial figure to life. But cramming so many events into nearly two-and-a-half hours means that its good intentions rarely spark, instead they only intermittently illuminate this version of Knight's passionate struggle. General release from Fri 30 Sep.
Newt Knight is a Mississippi farmer and Confederate soldier who rebels against the authorities and organises a group of escaped slaves into a militia. Based on a true story which feels considerably more interesting than the movie; Knight is too good to believe and the film's good intentions rarely spark.